Their is no question that the comic book superhero film is one of the most powerful forces in Hollywood today. It consistently dominates the box office every year, with Marvel having perfected the formula, releasing individual films in phases that tease future ones, and bringing their characters together in huge blockbuster team-ups that, at least at this stage, has led to Avengers: Endgame this April. DC, having achieved great success in the past with their Superman and Batman/Dark Knight franchises, are beginning to reap rewards once again as well, with the box office success and acclaim given to their recent Wonder Woman and Aquaman films. And, for the first time ever, a comic book superhero film has been nominated for an Academy Award for Best Picture, the hugely successful and culturally significant, Black Panther. Back in 2000, though, the comic book movie had fallen on dark times. 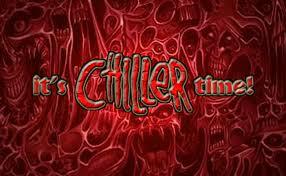 The Batman franchise had ground to a halt, and the comic book movies that were being released were more horror films with dark antiheroes, like Spawn and Blade. X-Men changed all that in the summer of 2000, opening the doors for Spider-Man two years later, and eventually, the beginnings of the Marvel Cinematic Universe, with Iron Man in 2008. But another comic book superhero film emerged later on in 2000, one that took a different and subtler approach than all the others. That film was M. Night Shyamalan’s Unbreakable. After the massive critical and box office success of 1999’s The Sixth Sense, which garnered six Academy Award nominations, expectations were high for Shyamalan’s follow-up film. Mystery surrounded the picture, again starring Bruce Willis, along with Samuel L. Jackson and Robin Wright, and audiences didn’t know going in, and still not until nearer the end of the movie, that they were seeing a comic book superhero origin story come to life. as Willis’ David Dunn slowly discovers that he possesses certain powers. It was a masterful piece of work, and while the film did well, and its stature has only grown since then, it was considered a bit of a disappointment at the time, especially considering what came before it. Night’s next film, the alien invasioner, Signs, did better, but his subsequent pictures, from The Village to After Earth, saw diminishing returns and frustration from audiences who felt he was relying too much on his patented twist endings. While Shyamalan had often spoke of wanting to continue the story he began with Unbreakable, it looked like that was becoming less and less likely with each passing work of his. But along came the low-budgeted The Visit in 2015, which restored some of Night’s credibility as well as making a good sum of change. That, in turn, led to 2017’s Split, starring James McAvoy as Kevin, who suffers from dissociative identity disorder, which results in his exhibiting multiple personalities, 23 in all, several of which have a penchant for abducting young women. (Read the Gore 4’s review of Split.) The film was a return to form for Shyamalan, and a big commercial and critical success. 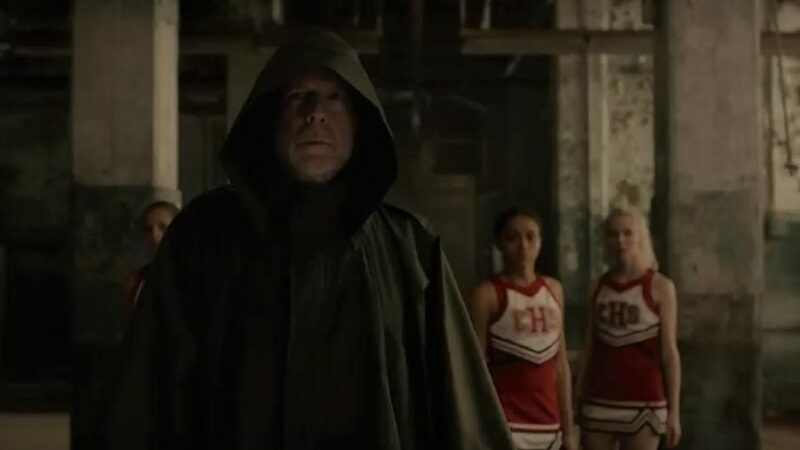 The biggest surprise, though, and the major twist unveiled at the end of the film, was that Split was actually a sequel to Unbreakable, with Willis’ Dunn showing up to reveal that they all inhabited the same world. Brilliant. Now that brings us up to date and ready for Glass. 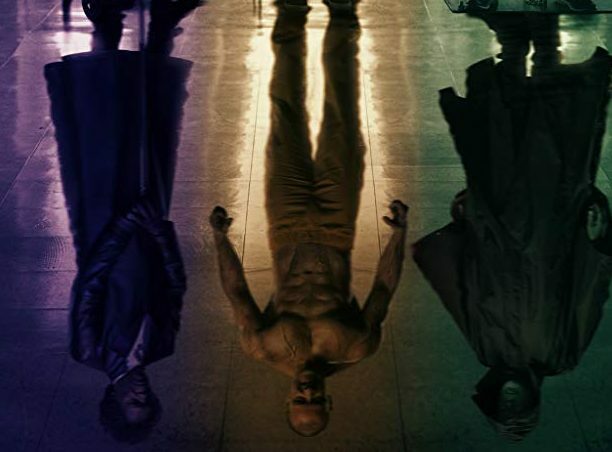 With Glass, we’re essentially getting a sequel to a sequel that we didn’t know was a sequel until the very end of the film, as well as a sequel to the first film. But now, all, OK, most of the cards have been left on the table, and we all know what’s up. Glass takes place approximately 19 years after the events of Unbreakable and several weeks after what transpired in Split. Kevin (McAvoy), and all his ‘companions,’ has been sent away to the Raven Hill Memorial Psychiatric Hospital, with Dunn (Willis) soon to follow. 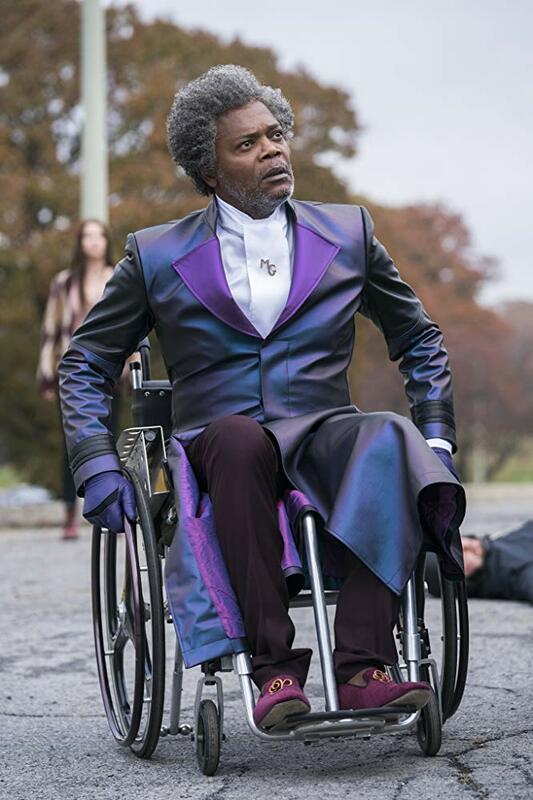 Also a resident of the facility is one Elijah Price (Jackson), aka, Mr. Glass, who has been locked up for the past almost two decades, ever since it was revealed (Unbreakable spoilers, just in case) that he was the mastermind of several horrific and deadly ‘accidents. You see, where David Dunn is incredibly strong and near invincible, Price is the polar opposite, a victim of osteogenesis imperfecta, which results in brittle bones that are prone to breaking at the slightest pressure or force, hence the nickname, Mr. Glass. It is an affliction that Price has had to contend with since a baby, and it has consumed his life to the point of madness as he searched for his place in this world. In Price’s mind, he is the arch-villain to Dunn’s superhero, and together they are real life comic book characters. Having apparently been in a catatonic state all these years, Price is seemingly awakened by the arrival of David and Kevin. In Kevin, or rather, his monstrous persona, the Beast, he believes he has an accomplice to take on David, and together, they can show the world that superheroes, and villains, do indeed exist. Attempting to treat what she calls ‘delusions of grandeur’ in these three patients is Dr. Ellie Staple (Sarah Paulson, American Horror Story). Also on hand are a trio of characters from the previous films – David’s now grown son, Joseph (Spencer Treat Clark), who runs a security business with his dad, Elijah’s sympathetic and understanding mom (Charlayne Woodard), and surviving kidnapping victim of Kevin’s, Casey (Anna Taylor-Joy, The Witch, Splice). All will have roles to play as the pages turn in our story. Glass, like Unbreakable and Split before it, is unlike any of the other superhero films out there, from Marvel to DC. Whereas those franchises beget huge, mega-budgeted, f/x filled extravaganzas, the world of Glass is more contained and much smaller in scale. That world is no less compelling, just a lot more subtle. Shyamalan once again employs the use of color to convey a character’s motivations or potential ‘side of justice’ he or she may land on. (Going back to Unbreakable, watch the scene where David reveals to his young son his latest activity, while a half-full (or empty, for you pessimists) glass of orange juice sits on the table before Joseph for a prime example.) As you can see in the above picture, Elijah is clearly in evil purple, while David is heroic green, and Kevin/Dennis/Patricia/Hedwig/the Beast, aka, the Horde, basked in yellow, could go either way. The film warrants further viewings to see if you may have missed any clues along the way. Does it all lead to another one of those classic M. Night surprise/not-really-a-surprise, but rather, accustomed to twist endings? You’ll have to see the film for yourself. OK, of course there’s some expected, unexpected revelation near the end, and it’s up to you to decide if it brings about a satisfying conclusion or not. Do you need to see the two films that precede Glass? You don’t, but it sure as hell will help, along with greatly adding to your enjoyment and appreciation of this film. 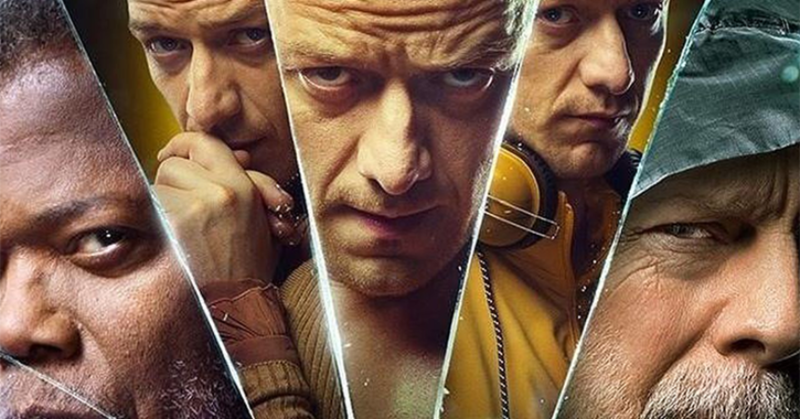 Of all the performances, McAvoy’s is clearly the showiest one, as he masterfully revisits his various Split personalities, as well as a few new additions to the mix. The transformations, from a nine-year old boy, to a British woman, to a literal Beast are startlingly abrupt, and McAvoy handles them deftly. It truly is an astounding performance, one which should have received an Oscar nomination before, and is just as worthy of one this time too. Bruce Willis exudes a quiet strength, as Dunn is now much more confident in his abilities, in an understated performance befitting of his character. The one and only Samuel L. Jackson makes for the perfect evil genius, exhibiting pure villainy, yet ascribing his character with an earnestness and sense of purpose that still manages to invoke some sympathy. Of the supporting players, Clark, as David’s son, Joseph, gives the most compelling and heartfelt performance. It’s a real treat, no pun intended, seeing his now established relationship with his father after knowing everything they went though together almost tow decades earlier. Really, the only character that doesn’t quite hit the mark is Paulson’s psychiatrist. Whether it’s the character itself, or Paulson’s performance, or a little of both, it’s hard to say, but Dr. Staple isn’t entirely effective in holding all the pages together. Glass features a number of nice touches, like the use of previously unused footage of a younger Willis and Clark from Unbreakable. There’s also the completion of the newest and tallest building in Philadelphia, the fictional Osaka Tower, which this Gore4er took as a nod to the infamous Nakatomi Plaza of Willis’ iconic Die Hard. And of course, there are all the references to comic book tropes sprinkled throughout the film, even though they are displayed in M. Night’s own unique and unconventional manner. Now this film will probably prove to be divisive among M. Night’s fans or comic book nerds because it doesn’t follow the normal superhero route. It’s not an action-packed, f/x-filled spectacular, and that’s great, because there are enough of those out there already. 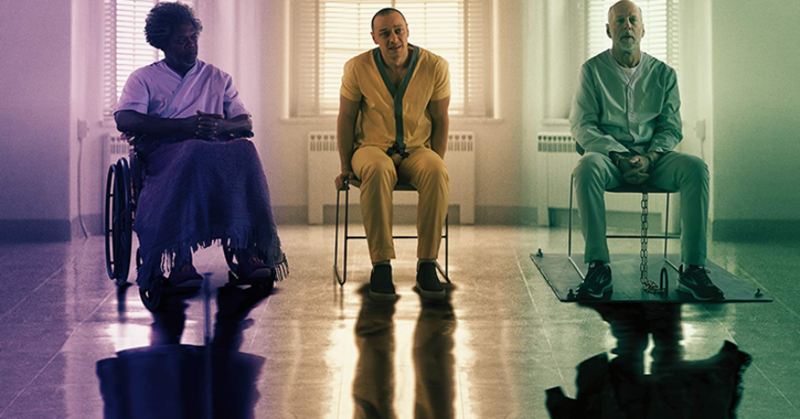 Instead, Glass is a low-key, intelligent, thoughtful, and heartfelt comic book come to life, with excellent performances and assured direction by M. Night Shyamalan. It’s the Unbreakable sequel we never thought we’d get, and now that we have, finally, almost twenty years later, well that’s a most welcome surprise ending. 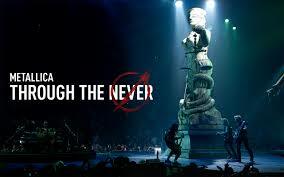 Metallica Through the Never never fails to rock!